In June of 2013 I wrote a quick overview of Lamentations of the Flame Princess. It was strictly an overview of the material and my thoughts on the rules based on my previous old school gaming experiences. Tomorrow night I will finally get the chance to play a game of LotFP during the ANTIGENCON online RPG event. Originally posted at RPG Geek. Wow, where to begin with this small box of gaming material? 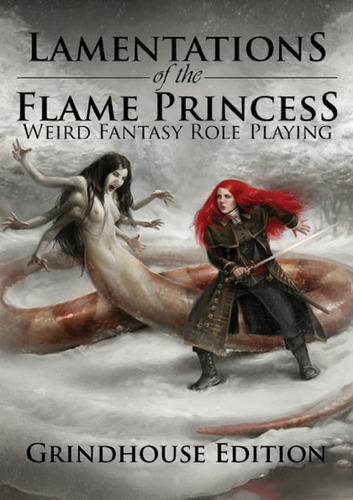 To start, Lamentation of the Flame Princess (LotFP) falls squarely into what is commonly referred to as the Old School Renaissance (OSR) RPG movement. These are games that are based on or in part take cues from the older editions of the world’s most popular RPG. As part of the OSR movement the game material is published under the d20 OGL. What exactly is LotFP? This RPG at its core is a Weird horror-based Fantasy RPG that takes many cues from early RPG system, commonly known as the Rules Cyclopedia with a d20 attack mechanic replacing what used to be called Thac0 in the older systems. LotFP lets players and GMs explore the more horrific and weird side of fantasy roleplaying all the while keeping the mechanics simple, streamlined and easy to implement. LotFP takes horror fantasy to a new level with inclusion of the weird. It should be noted that the system and theme are very scalable so that if you have players that are not comfortable with the weirder elements that the game could have, you as the GM can dial it back and make it more suitable for the players or even the location in which the game is being played. Full disclosure, I am not new to the OSR movement, but I have yet to run this RPG at the table. My comparisons to older editions are based on my experience with older mechanics that have found their way into the rules of LotFP. The Grindhouse edition comes in small, side opening flip top box that is adorned in full color art. The box contains three books entitled: “Rules and Magic”, “Referee” and “tutorial”. In addition to the books, there are a half dozen character sheets and even a set of polyhedron dice. The physical books are perfect bound; digest sized softcover books that hold up rather well to reading and thumbing. As a general rule I am not the biggest fan of digest sized softcover books, but these are holding up nicely to my constant thumbing and reading. Though 95% of all art work is black and white, there are some great full color art pieces in the “Rules and Magic” book. The “Rules and Magic” book takes a player and GM through the character creation process, generalized rules that both must be familiar with. For example, how initiative in combat works, how spells are memorized and other such rules that are staples in the fantasy RPG genre. The second part of the book is a consolidated collection of all the spells available in the RPG that the different classes that are capable of spell casting have access to. The “Referee” book is a smorgasbord of GM tips and tricks that apply to new and veteran GMs alike. In this book you will find definitions of different adventure types, tips for creating adventures and campaigns and ton of other useful information. This is a must read for any GM. Much of what is contained in the book is system neutral. The “Tutorial” book is just that a tutorial for new players. The book presents or reaffirms some basic RPG concepts and mechanics. It presents the reader with an extensive example of play, map making tips, and much more. It also provides a choose your own adventure type scenario that allows new players to get comfortable with core mechanics. The books, all three of them, are very easy to read and have a very natural flow to them. Unlike many rules books out there, the rules are presented in a very logical, easy to read and even easier to comprehend manner. Kudos to the design team for taking the time to make the books easy to read and understand. The character sheets are also digest sized. They are clear and easy to follow with ample space for all necessary information. The artwork contained with the three books that are included it absolutely amazing! The horror and weird element take center stage in the art pieces. The colors used, the shadowing effects and the subject matter are ooze theme that is more than appropriate for this RPG system. Please understand that much of the artwork would not be suitable for younger readers or players. The box does come with a 18+ warning on the back side. As a product that I have had my eye on for quite some time, I was more than excited when this showed up in the mail as a gift. I have been devouring every word in the books. Instantly I fell in love with the concept of horrific fantasy that deviates from the norm that already exists on the market. The art is amazing and grabbed me at first glance! I am really looking forward to getting this RPG to the table and running it. I suspect that this will feel like most OSR systems at the mechanical level, but will shine in its own way based on theme alone. Previous Post NO GENCON or Bust!